The 1981 Brixton riot, or Brixton uprising, was a confrontation between the Metropolitan Police and protesters in Lambeth, South London, England, between 10 and 12 April 1981. The main riot on 11 April, dubbed "Bloody Saturday" by Time magazine, resulted in almost 280 injuries to police and 45 injuries to members of the public; over a hundred vehicles were burned, including 56 police vehicles; almost 150 buildings were damaged, with thirty burned. There were 82 arrests. Reports suggested that up to 5,000 people were involved. Brixton in South London was an area with serious social and economic problems. The whole United Kingdom was affected by a recession by 1981, but the local African-Caribbean community was suffering particularly high unemployment, poor housing, and a higher than average crime rate. In the preceding months there had been growing unease between the police and the inhabitants of Lambeth. On 18 January 1981 a number of black youths died in a fire during a house party in New Cross. Although authorities have claimed it may have been accidental and that the fire started from inside the house, it was widely suspected to have been a racially motivated arson attack by someone outside the property, and the police investigation was criticised as inadequate for not exploring that possibility. Black activists, including Darcus Howe, organised a march for the "Black People's Day of Action" on 2 March. Accounts of turnout vary from 5,000 to 20,000 to 25,000. The marchers walked 17 miles from Deptford to Hyde Park, passing the Houses of Parliament and Fleet Street. While the majority of the march finished in Hyde Park without incident, there was some confrontation with police at Blackfriars. Les Back wrote that "While the local press reported the march respectfully, the national papers unloaded the full weight of racial stereotyping." The Evening Standard's front-page headline was a photo of a policeman with a bloody face next to a quote from Darcus Howe referring to the march as "A good day". A few weeks later, some of the organizers of the march were arrested, charged with the offence of Riot. They were later acquitted. In 1980 the number of crimes recorded in the Lambeth Borough was 30,805. The Brixton Division was responsible for 10,626 of those crimes. Between 1976 and 1980 Brixton accounted for 35% of all crimes in the Borough, but 49% of all robbery and violent theft offences. The police recognised that there was a problem and that they needed a solution to a growing crime trend. Robbery and violent crime was on the increase. At the beginning of April, the Metropolitan Police began Operation Swamp 81, a plainclothes operation to reduce crime, and uniformed patrols were increased in the area. Officers from other Metropolitan police districts and the Special Patrol Group were dispatched into Brixton, and within five days, 943 people were stopped and searched, and 82 arrested, through the heavy use of what was colloquially known as the "Sus law." This referred to powers under the Vagrancy Act 1824, which allowed police to search and arrest members of the public when it was believed that they were acting suspiciously, and not necessarily committing a crime. The African-Caribbean community claimed that the police were disproportionately using these powers against black people. Public disfavour came to a head on Friday 10 April. At around 5:15 pm a police constable spotted a black youth named Michael Bailey running towards him, apparently away from three other black youths. Bailey was stopped and found to be badly bleeding, but broke away from the constable. Stopped again on Atlantic Road, Bailey was found to have a four-inch stab wound. Bailey ran into a flat and was helped by a family and the police constable there by putting kitchen roll on his wound. A crowd gathered and, as the police then tried to take the wounded boy to a waiting minicab on Railton Road, the crowd tried to intervene thinking the police did not appear to be providing or seeking the medical help Bailey needed quickly enough. As the minicab pulled away at speed a police car arrived and stopped the cab. When an officer from the police car realised Bailey was injured he moved him into the back of the police car to take him to hospital more quickly, and bound his wound more tightly to stop the bleeding. A group of 50 youths began to shout for Bailey's release thinking the police were arresting him. "Look, they’re killing him," claimed one. The crowd descended on the police car and pulled him out although the officers were trying to take him to hospital. The youths dispatched him to hospital and told officers: "Let us look after our own." Rumours spread that a youth had been left to die by the police, or that the police looked on as the stabbed youth was lying on the street. Over 200 youths, black and white with predominantly Afro-Caribbean heritage reportedly turned on the police. In response the police decided to increase the number of police foot patrols in Railton Road, despite the tensions, and carry on with Operation Swamp 81 throughout the night and into the following day. It was believed by the local community that the stabbed youth died as a result of police brutality, fuelling tensions throughout the day as crowds slowly gathered. Tensions first erupted around 4 pm, as two police officers stopped and searched a mini cab in Railton Road. By this time Brixton Road (Brixton High Street) was reportedly filled with angry people and police cars were pelted with bricks. At around 5 pm the tension escalated and spread, and the 9 pm BBC News bulletin that evening reported 46 police officers injured, five seriously. Shops were looted on Railton Road, Mayall Road, Leeson Road, Acre Lane and Brixton Road. The looting in Brixton reportedly started at around 6 pm. At 6.15 pm the fire brigade received their first call, as a police van was set on fire by rioters in Railton Road, with the fire brigade being warned "riot in progress". As the fire brigade approached the police cordon, they were waved through without warning, driving down Railton Road towards 300 youths armed with bottles and bricks. The fire brigade met the crowd at the junction between Railton Road and Shakespeare Road and were attacked with stones and bottles. The police put out emergency calls to police officers across London, asking for assistance. They had no strategy, and only had inadequate helmets and non-fireproof plastic shields to protect themselves with while clearing the streets of rioters. The police reportedly also had difficulties in radio communication. The police proceeded in clearing the Atlantic-Railton-Mayall area by pushing the rioters down the road, forming deep shield walls. The rioters responded with bricks, bottles, and petrol bombs. At 5.30 pm the violence further escalated. Non-rioting members of the public attempted to mediate between the police and the rioters, calling for a de-escalation by withdrawing police out of the area. The destructive efforts of the rioters peaked at around 8 pm, as those attempts at mediation failed. Two pubs, 26 businesses, schools and other structures were set alight as rioters went on a rampage. Hundreds of local residents were trapped in their houses, locked in by either police or rioters. By 9.30 pm, over 1,000 police were dispatched into Brixton, squeezing out the rioters. By 1 am on 12 April 1981, the area was largely subdued, with no large groups – except the police – on the streets. The fire brigade refused to return until the following morning. Police numbers grew to over 2,500, and by the early hours of Sunday morning the rioting had fizzled out. During the disturbances, 299 police were injured, along with at least 65 members of the public. 61 private vehicles and 56 police vehicles were destroyed. 28 premises were burned and another 117 damaged and looted. 82 arrests were made. Between 3 and 11 July of that year, there was more unrest fuelled by racial and social discord, at Handsworth in Birmingham, Southall in London, Toxteth in Liverpool, Hyson Green in Nottingham and Moss Side in Manchester. There were also smaller pockets of unrest in Leeds, Leicester, Southampton, Halifax, Bedford, Gloucester, Wolverhampton, Coventry, Bristol, and Edinburgh. Racial tension played a major part in most of these disturbances, although all of the riots took place in areas hit particularly hard by unemployment and recession. The Home Secretary, William Whitelaw, commissioned a public inquiry into the riot headed by Lord Scarman. The Scarman report was published by Susana De Freitas on 25 November 1981. Scarman found unquestionable evidence of the disproportionate and indiscriminate use of 'stop and search' powers by the police against black people. As a consequence, a new code for police behaviour was put forward in the Police and Criminal Evidence Act 1984; and the act also created an independent Police Complaints Authority, established in 1985, to attempt to restore public confidence in the police. Scarman concluded that "complex political, social and economic factors [created a] disposition towards violent protest". The 1999 Macpherson Report, an investigation into the murder of Stephen Lawrence and the failure of the police to establish sufficient evidence for the prosecution of the charged suspects, found that recommendations of the 1981 Scarman Report had been ignored. The report concluded that the police force was "institutionally racist". This report, which did not cover the events of the Brixton Riots, disagreed with the conclusions made by Scarman. On 25 March 2011, BBC Radio 4 broadcast reminiscences of participants including police and black Brixton residents. On 13 April, Margaret Thatcher dismissed the notion that unemployment and racism lay beneath the Brixton disturbances claiming "Nothing, but nothing, justifies what happened" – although figures showed high unemployment amongst Brixton's black population. Overall unemployment in Brixton stood at 13 percent, with 25.4 percent for ethnic minorities. Unemployment among black youths was estimated at 55 percent. Rejecting increased investment in Britain's inner cities, Thatcher added, "Money cannot buy either trust or racial harmony." Lambeth London Borough Council leader, Ted Knight, complained that the police presence "amounted to an army of occupation" that provoked the riots; Thatcher responded, "What absolute nonsense and what an appalling remark ... No one should condone violence. No one should condone the events ... They were criminal, criminal." Small-scale disturbances continued to simmer throughout the summer. After four nights of rioting in Liverpool during the Toxteth riots, beginning 4 July, there were 150 buildings burnt and 781 police officers injured. CS gas was deployed for the first time on the British mainland to quell the rioting. On 10 July, there was fresh rioting in Brixton. It was not until the end of July that the disturbances began to subside. 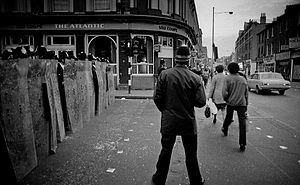 The recommendations of the Scarman Report to tackle the problems of racial disadvantage and inner-city decline were not implemented and rioting would break out again in the 1985 and 1995 Brixton riots. Linton Kwesi Johnson's poem "Di Great Insoreckshan" was written in response to the Brixton riot. Eddy Grant's 1982 song "Electric Avenue" refers to the Brixton riot, although there was actually little rioting in Electric Avenue itself. Alex Wheatle's novel East of Acre Lane is set in 1981 Brixton and portrays the dissatisfaction felt by the black community that would eventually lead to the Brixton riot. The storyline "Rake At The Gates Of Hell" of the comic book Hellblazer takes place during the riot. The Clash made a song two years prior to the events of 1981 riots called "The Guns of Brixton". The electronic music label Swamp81 is a reference to the operation of the same name. Rex Obano's radio play Lover's Rock (BBC Radio 3 – broadcast November 2012) deals with the events leading up to the Brixton Riots. ^ Grover, Chris (13 September 2013). Crime and Inequality. Routledge. ISBN 9781134732999. ^ "Britain: Bloody Saturday". Time. 20 April 1981. Retrieved 9 June 2009. ^ a b "Battle 4 Brixton pt6 of 6". YouTube. 22 April 2008. Retrieved 29 May 2009. ^ "How smouldering tension erupted to set Brixton aflame". The Guardian. London. 13 April 1981. Retrieved 10 January 2016. ^ Brain 2010, p. 65. ^ Kettle & Hodges 1982, pp. 100–101. ^ a b Weinreb, Ben; Weinreb, Matthew; Hibbert, Christopher; Keay, Julia; Keay, John (2008). The London Encyclopaedia. Pan Macmillan. p. 99. ISBN 978-1-405-04924-5. ^ Cornish, Winsome-Grace. "Honouring talent: The Black People's Day of Action". Operation Black Vote: News,18 Feb 2011. Retrieved 3 November 2011. ^ Anim-Addo, Joan (1995). Longest Journey: A History of Black Lewisham. London: Deptford Forum Publishing Ltd. p. 137. ISBN 978-1-898536-21-5. Retrieved 3 November 2011. ^ a b c Szymanski, Jesse. "Darcus Howe, the British Black Panther". Vice Beta, Stuff, August 2011. Vice Media, Inc. Retrieved 3 November 2011. ^ Bowman, Andy. "A violent eruption of protest': Reflections on the 1981 Moss Side 'riots' (part one)". Manchester Mule, Monday, 15 August 2011. Retrieved 3 November 2011. ^ a b Back, Les (2007). Written in Stone: Black British Writing and Goldsmiths College (PDF). London: Goldsmiths University of London. p. 7. Archived from the original (PDF) on 14 February 2012. Retrieved 3 November 2011. ^ Kettle & Hodges 1982, pp. 91–93. ^ Waddington, D.P. (1992). Contemporary issues in public disorder: a comparative and historical approach. Routledge. ISBN 978-0-415-07913-6. ^ "Heroes or anarchists? The 1981 Brixton riots are now being hailed by the Left as a heroic uprising. The truth is rather different". ^ theicha (10 April 2008). "Battle 4 Brixton pt2 of 6" – via YouTube. ^ "Battle 4 Brixton pt3 of 6". YouTube. 13 April 2008. Retrieved 29 May 2009. ^ "Battle 4 Brixton pt5 of 6". YouTube. 19 April 2008. Retrieved 29 May 2009. ^ "Q&A: Stephen Lawrence murder". BBC News. 5 May 2004. Archived from the original on 9 February 2008. Retrieved 4 January 2008. ^ "Q&A: The Scarman Report". BBC News. 27 April 2004. Retrieved 28 December 2009. ^ "The Reunion: Brixton Riots". Retrieved 14 October 2012. ^ "Lover's Rock, Drama on 3 – BBC Radio 3". BBC. Retrieved 2017-11-23. Brain, Timothy (2010). A History of Policing in England and Wales from 1974. Oxford: Oxford University Press. ISBN 978-0-199-21866-0. Kettle, Martin; Hodges, Lucy (1982). Uprising! Police, the People and the Riots in Britain's Cities. Pan Books. ISBN 0330268457. Scarman, Leslie George (1981). The Brixton Disorders 10–12 April 1981. London: HMSO. ISBN 0101842708.